The architect and open source design advocate Daniel Dendra talks at Ecosummit 2011 about the need to share design and architecture know-how globally using the power of the Internet to accelerate the smart green transformation of the built environment. Daniel is founding partner of OpenSimSim and anOtherArchitect. I like Daniel’s ideas as I am currently thinking about a new Internet platform for prefab build-to-order smart green buildings. Reusing the best ideas for cost-efficient smart green buildings while integrating the best materials, designs and appliances – that’s a powerful vision. 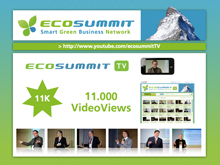 We are proud to announce having reached a new major milestone on Ecosummit TV, our wonderful Youtube HD channel: 11.000 VideoViews since we started in February 2011. This is a good reason for rewatching some of the best episodes on Ecosummit TV featuring smart green startups and VCs. Learn about hot Cleantech deals worth backing and how you should invest your fund for successful returns. One more thing: Ecosummit 2012 takes place on 22-23 March 2012 in Berlin and it’s going to be big. Stay tuned! Joachim Maass, Founder and CEO, pitches his German startup Solar Tower Systems to investors at ECO11. Solar Tower Systems is in the very promising business of CSP (Concentrated Solar Power), has the first customers and revenues, a strong management team and currently looks for €1.5M funding. Should be an easy deal. Invensor’s smart green cooling technology called adsorption converts heat into cold without using electricity. With this approach you can save up to 70% of electricity costs, e.g. in your data centres. Soeren Paulussen, Co-Founder and Head of System Technology, pitches Berlin-based Invensor to investors at ECO11. Erwin Burth is Head of Cleantech Business Development EMEA at Autodesk, the famous CAD (Computer Aided Design) software company. It’s just pure magic how you can do intelligent product design using cool software and the power of cloud computing. At ECO11, Erwin presents the generous Autodesk Cleantech Partner Programme that provides free Autodesk software with a value of €120K ($150K) to Cleantech startups. Among the ECO11 startups, Pyrum, NTS and Solar Tower Systems are members of the Autodesk Cleantech Partner Programme. Apparently, it is rather easy to get accepted into the programme. So what are you waiting for? Frauke Mispagel, Co-Founder and Co-CEO of Berlin-based startup Ecogood, pitches to investors at ECO11. Ecogood provides carbon management solutions to consumers and corporates. The Climate Vignette offsetting carbon emissions of cars is a good example. Ecogood’s current investor is the Berlin-based Sustainability VC MAMA and it will raise another €1M funding round towards the end of 2011. Now you can enjoy Frauke on Ecosummit TV. Robert Seiter, Head of Cleantech EMEIA at accounting firm Ernst & Young, presents Global Cleantech Venture Insights at ECO11. In 2010, the Cleantech industry received 15% of global VC investments and proves that it is a huge business opportunity. As of Q3/2010, there are 1.434 private VC-backed Cleantech companies with €22.16B in equity raised. US companies are funded at a 4 times higher level than European companies while the Energy Efficiency sector turns out to be especially popular among VCs. Now you can watch Robert’s ECO11 talk on Ecosummit TV. These guys want to make one of the biggest cleantech deals in Germany by the end of 2012 – at the latest. Their ambition is great and their budget is big. Their Special Purpose Acquisition Company (SPAC) European Cleantech 1 (ECT 1) is a recently listed public company that raised €115M to acquire a private cleantech company and take it public at the same time via a business combination. If you are a super successful private cleantech company in Europe and want to go public fast, you should talk to Sven soon. This new Ecosummit TV episode showcases the views of 3 leading Cleantech VCs and the law firm Taylor Wessing on the hot trends in the Cleantech VC industry. Enjoy Peter Hellich (Taylor Wessing), Joerg Sperling (WHEB Partners), Felix von Schubert (Zouk Capital) and Bruno Derungs (Climate Change Capital), moderated by Jan Michael Hess (Ecosummit), talking about the deals they make and the deals they would like to make. French-German tire recycling Cleantech company Pyrum Innovations really is a smart green startup jewel. Pascal Klein, CEO of Pyrum, delivers a professional investor pitch at ECO11. Pascal embodies the new generation of smart green entrepreneuers raising millions of venture capital for a smarter and greener way of reusing our resources and minimising waste. He is 24 years old. We need more young founders willing to accelerate the transformation to the Smart Green Economy. Enjoy Pascal on Ecosummit TV and get in touch if you look for a hot startup deal. Antoine Gourdon pitches his French water treatment technology startup TMW Technologies at Ecosummit 2011 in Berlin. Watch this Ecosummit TV episode to learn more about the startup, the investment opportunity of €2M and the growing water technology market. The management team is very strong and I am sure that they will be successful. The Green Economy is the best idea for the future of mankind or, in other words, going green is smart. Prof. Dr. Claudia Kemfert, Head of the Energy Department at the German Institute of Economic Research, talks about the Economic Chances of the Green Economy at Ecosummit 2011 in Berlin. Claudia is also Professor for Energy Economics at the Hertie School of Governance in Berlin. It’s definitely worthwhile watching one of the leading German energy economists on Ecosummit TV. Staffan Hillberg, CEO of Heliospectra, pitches his Swedish smart green startup to investors at ECO11. Heliospectra has some really cool and healthy LED lighting technology for greenhouses improving the growth and reducing the energy costs for the sake of energy efficient agriculture. If you are into (vertical) urban farming and the future of greenhouses, get in touch with Heliospectra. Bruno Derungs, Partner of Climate Change Capital Private Equity, talks about Cleantech for Smart Cities and Smart Buildings at Ecosummit 2011. Bruno is now on our Youtube Ecosummit TV channel. Climate Change Capital – I really like the name – is a London-based smart green investor that combines various teams investing in different asset classes including technology companies (private equity) and energy infrastructure (project financing). Ecosummit 2011 is climate neutral now. We are happy to announce that we have finalised the carbon offset of Ecosummit 2011 together with our partner and ECO11 silver sponsor ForestFinance using their carbon management service CO2OL. We calculated a carbon footprint of 190 tons CO2 emissions for ECO11 caused by 300 participants gathering in Berlin on 24-25 March 2011 (0.63 tons CO2 per person). Peter Ripplinger, CEO of Subitec, pitches the promising algae factory startup at ECO11 in Berlin. Subitec uses flat-panel airlift (FPA) photobioreactors to produce designable algae biomass on industrial scale with low consumption of resources. Peter claims that net energy production is only possible with their FPA bioreactors. Subitec is powered by patents developed at the Fraunhofer Institute and backed by the High-Tech Gründerfonds. Every city should become a Smart Green City as soon as possible. One way to accelerate urban change is to focus ideas, people and capital in a new city quarter where the future can be prototyped by a cluster of companies and citizens that believe in sustainability, renewable energy, clean technologies and intelligent design. Kolding is such a future-minded Danish city with 90.000 citizens located in the south of Denmark, 100 km north of Flensburg. Design City Kolding is planned as a new sustainable city quarter on 22 hectares developed by Design City Vest A/S.